I love hydrangeas and am always excited to see them blooming in my yard and elsewhere. 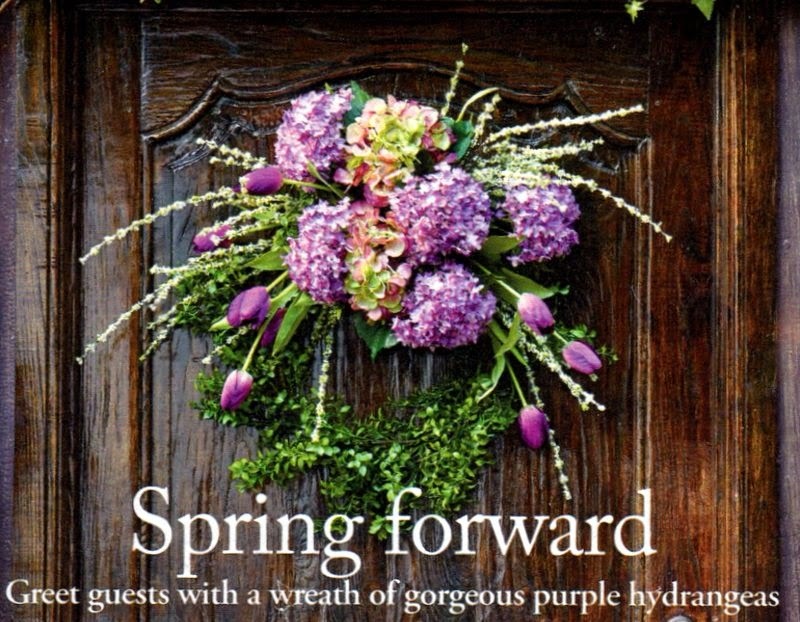 While looking through a spring issue of Frontgate I came across a beautiful picture of a hydrangea door wreath. So pretty but at $299., I could only look and admire. However, the crafter in me was calling so softly to try making one . . . I gathered the flowers and a wire form wreath . . .
and came up with this . . .
You might be saying what happened to the green tulips in the materials picture? I tried them out but didn't like the bright green look and I couldn't find any deep pink tulips. And I used fabric paint on the solid green hydrangeas to tone them down a bit. 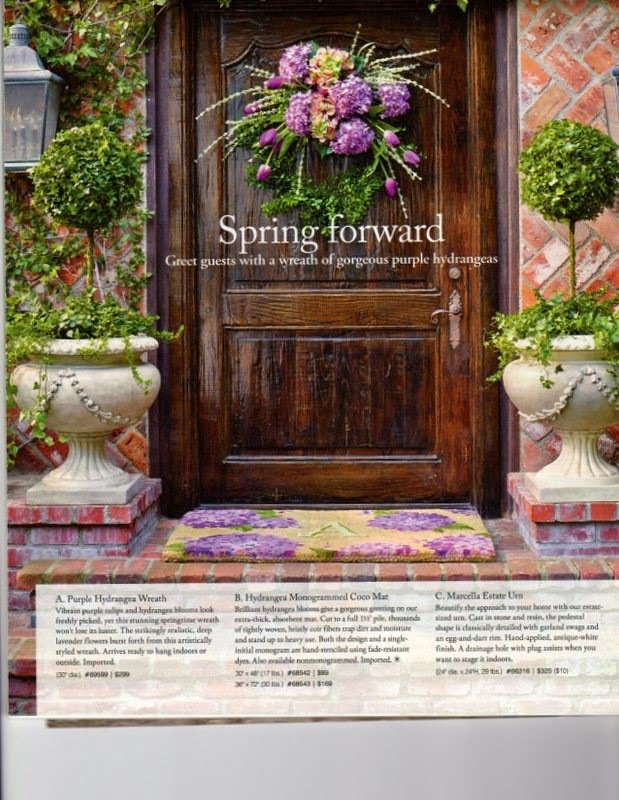 I love the look, but wish I had a fabulous wooden door like the one pictured to hang it on. But this will have to do! And here's a few of my garden hydrangeas that inspired me . . .
Oops . . . had to show my beautiful calla lily! How pretty, Gail! I love your version. Your front entry looks so inviting with your wreath and pretty planters. I love the flowers growing in your yard. You have such a green thumb! That is absolutely beautiful! I did have a giggle at the calla lilies though, I adore them and have a coupe of huge plants that I literally prune back to nothing each year. I went looking for colours other than white because they're do beautiful and take no care at all...turns out they were introduced here and declared a weed you can't buy the plants anymore, however they're truly the most gorgeous "weed" I've ever seen. So pretty, Gail! I think it looks perfect on your door ( which by the way is a nice door!). Your garden is absolutely beautiful! I could spend all day sitting in it enjoying those lovely flowers! Your wreath is just beautiful Gail! I love the all the pink in the wreath and in your garden. The wreath is quite lovely - love the shape and the colors used. Beautiful photos of your bloomers. Your hydrangea wreath is exquisite, dear one!!! Love the vibrant hues and various textures!!! Visiting from Christine's Table It! Gosh Gail- that turned out very pretty! You did a great job of recreating the one at Frontgate! They sure do ask a lot for their products don't they! Hi there! Visiting from Our home away from home. Your wreath is beautiful & I adore your fresh hydrangeas! Your hydrangea wreath is beautiful. Great job! Pretty real hydrangeas too. Happy 4th to you. Wow, it looks perfect to me! LOVE the wreath! Wonderful wreath, Gail! Your hydrangeas are really beautiful and I love the color of the ones you used! Sunning calla lily! Oh my gosh Gail! Your wreath is PEFECT! I think you did a great job of mimicking the picture in the magazine. It really looks so pretty on your door. Good Job! Thanks for sharing with Fresh-Cut Friday! This turned out so so lovely!! Thanks for sharing at our Link it or Lump it party. You did an amazing job! I love you wreath, it pops on your white door.